You can’t not like Brussels sprouts after you taste this salad. It’s like the epitome of brussels sprout potential—roasted and then, and THEN…. slathered in the most deliciously creamy (yet vegan) and totally decadent curry sauce. And ya know, throw some chewy golden raisins and crunchy toasted walnuts in there just cuz. This salad is everything. The flavor and texture is nothing short of spot on. Blending almonds and water as the base of the dressing creates this insane creaminess that’s quite literally finger-lickin’ good. The slight sweetness in the dressing comes from dates, my favorite natural sweetener ever. I’m convinced that dates have no flaws. I originally made this salad for Alchemy because it gets better and better as the flavors merry together in the fridge. I know people turn their noses up at Brussels sprouties, but trust me, these aren’t the boring boiled kind that plagued your childhood. You have no option but to make them and love them and make them again and love them even more the next time. Though I’m no carnivore, I have a strong hunch that these would be quite tasty with some bacon mixed in. Perhaps some coconut bacon or eggplant bacon for us herbies? This is like the little black dress of salads. Everyone needs one! Packed with golden raisins and toasted walnuts, this creamy brussels sprout salad is so delicious that you’d never guess it was healthy and guilt-free! Slice ends off brussels sprouts and then slice in halves or thirds. Place in an even layer on lined baking sheet (you may need two). Drizzle with olive oil. Roast for 20-25 minutes, or until browned. Meanwhile, combine all dressing ingredients in a blender. Blend until completely smooth and creamy. 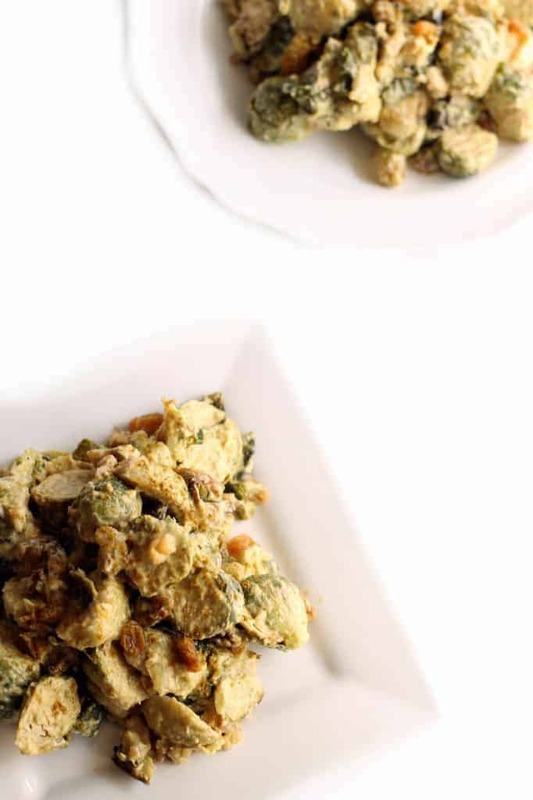 In a large bowl, combine roasted brussels sprouts, golden raisins, and walnuts. Drizzle the with the dressing and toss to combine. Love adding a little bit of sweetness to Brussels, it just works! 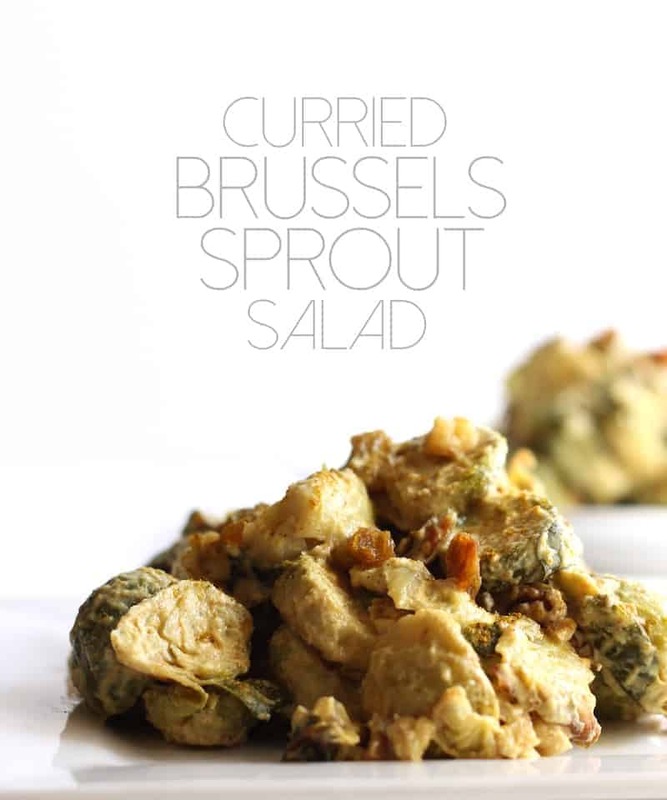 This is such a creative recipe, all I need is to buy the Brussels sprouts to make it, awesome! What?!? I want this in my face. B sprouts are my bf’s most hated veggie so I’m going to have to test him out on this. 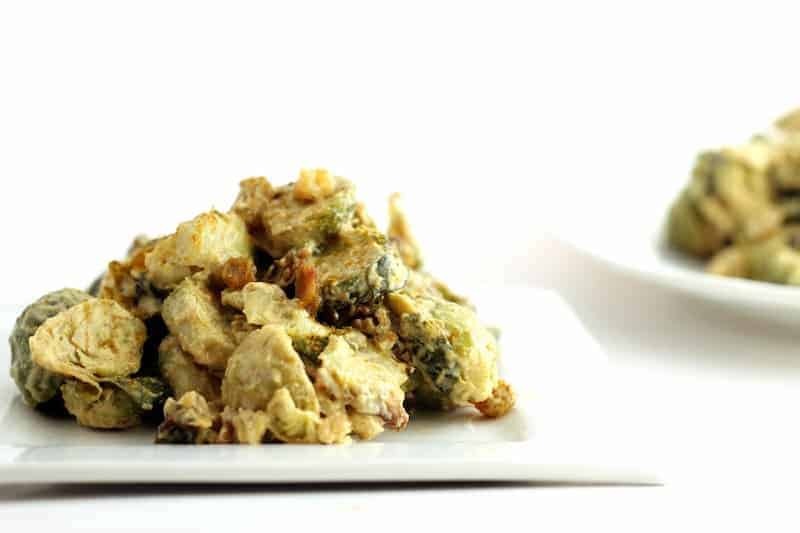 Also gonna share a link to this in my Health Benefits of Brussels Sprouts article! I love brussels! I’ve never cooked with curry though! Hooray, so glad you decided to publish this recipe! Since in all likelihood I will not be making it from Utah to Alchemy anytime soon :( I will 100% be making this and couldn’t be more excited about it! I <3 Brussels sprouts, no matter what the haters say. Prepare yourself for a new favorite! I want this in my belly like right now! You NEED this in your belly right now!! this is like the LBD of salads…oh no you didduhhhhn. AMAZING. I’ve got everything on hand (plus bacon because an alien has taken over my body and made me crave it like a freak) and this is HAPPENING. Like for real. this week. Come join. Bring your Dad and the mussels. Yew bacon alien, yew! So Jewish of you. This is…I have no words. I love curry, I love brussels sprouts. Geebuz. No words necessary. Just eat. Hhaha love it! SO worth it. I have Brussels sprouts sitting in my fridge right now that I was trying to decide how to cook so my husband will eat them. I’m going to try this, he loves curries! Looks SO good. I picked up the things I needed and I just made this. Wow! It was easy and it is so delicious!! Thank you so much!!! I MUST try a variation of this for sure!! MMMMMM yum! I made this last week and fell in love! The flavors and textures are so perfect together. We used goji berries because my hubby has some odd raisin aversion. Next time I’m doubling it to ensure lots of leftovers! Awwww fabulous! It’s kind of addicting isn’t it?! Love it!!! I’ve affectionately nicknamed this dressing the “crack curry sauce” because every time I make it, I can’t help but get every little drip out of the food processor with my hands, Poor Bear-style…seriously no shame! I’ve used cashews instead almonds since I have a huge bag to use up and found that the dressing is also great on roasted broccoli, cauliflower, and mixed winter veggies. Thanks for sharing! Mallory, this was the funniest comment ever! I’m so thrilled that you’re loving the salad Pooh-bear style. I can’t wait to try it with cauliflower! Literally obsessed with this recipe! Drooling just thinking about it. Second time making it and this time I added a can of chickpeas, which I roasted with the brussel sprouts. Made for a great protein and veggie packed meal! oh my gosh. love love love. Roasted brussels sprouts IN a salad?! ugh. I can’t. I just can’t. But oh YES i totally can for this salad. Genius idea, cannot wait to try it out!! I love this dressing! I made the salad with asparagus because my grocery store didn’t have Brussels sprouts. My 3-year-old son would not stop eating the extra dressing with a spoon!